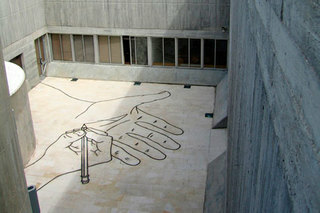 Founded in 1965, Herzliya Museum of Contemporary Art is dedicated to Israeli and international Contemporary art. Herzliya Museum of Contemporary Art focuses mainly on art works that offer different perspectives on the social and political situation, alongside works that explore the intra-artistic discourse, all the while nurturing the future generation of Israeli art. In a country such as Israel, existing in a state of constant tension and ceaseless wars, art plays a significant role in establishing and shaping the social discourse. Each year the museum presents four exhibitions cycles comprised of some fifty solo shows, linked by their relevance to current events. These are not group shows, but a cluster of different perspectives by various artists, a platform which strengthen each work by itself, expands the contexts and opens further channels for interpretation and deeper layers of meanings. The fascinating confluence of local and international artists emphasizes the power of art to cross borders, be communicative and perhaps even make a difference.